Underwriters Laboratories Listed Type 1, VdS Class 2, CEN B, A2P B, DNV, and RoHS (Reduction of Hazardous Substances) compliant. The Titan PivotBolt™ lock features a new design, motor driven locking mechanism for an extra measure of security and longer battery life. The Titan PivotBolt™ automatically locks to re-secure the safe whenever the container’s boltwork moves to the fully closed position, discouraging the common (non-secure) practice of day-locking. 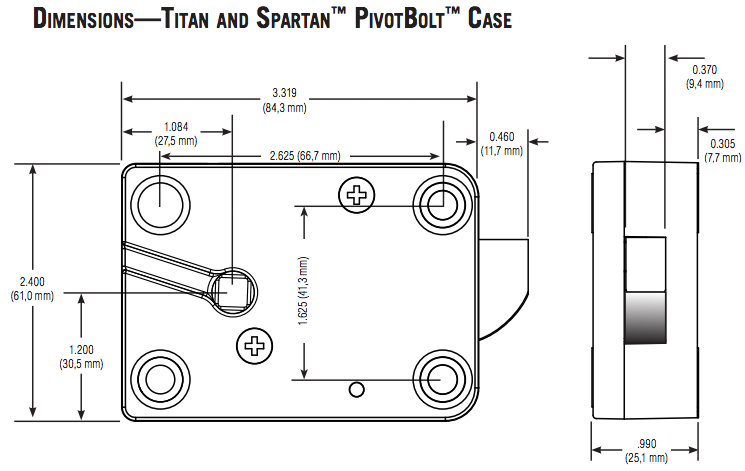 The Titan PivotBolt™ is connected to the keypad only by cable, which means the lock does not need to be placed directly behind the keypad. It can be located anywhere on the inside of the safe door. S&G Magic Module footprint for easy retrofit, and it’s universally handed and reversible for RH, LH, VU, and VD mounting. Three modes of operation: Multi-User, Manager/Employee, Dual Control. Management reset code, one master code, one supervisor code, eight user codes, and one time delay override code*. The management reset code (MRC) lets you set a new master code of your own choosing if the old master code is lost or forgotten. The Titan PivotBolt™ has a penalty time feature to prevent opening by entering sequential or random codes until a valid code is found. The lock bolt model withstands 225 lbs. (1000 newtons) of bolt end pressure for a high level of security in boltwork blocking applications. Can be used with the S&G 2-battery keypad, standard 1-battery keypad (lighted and non-lighted), or the non-rotating low profile keypad.